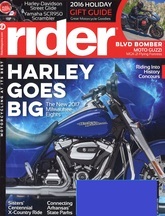 To get your one-year subscription to Rider, plus find out what FREE business publications you could qualify to receive, simply complete the following information to get started. Allow 4-12 weeks for delivery. Subscriptions and offers available only to qualifying residents of the 50 United States, Puerto Rico, and Washington D.C.